FOX has announced that their upcoming comedy series, The Mick, will have a special premiere on Sunday, January 1st. The premiere will follow an NFL football doubleheader. The Mick TV show will launch in its regular timeslot on Tuesday, January 3rd. The show features the talents of Kaitlin Olson, Sofia Black-D’Elia, Thomas Barbusca, Jack Stanton, Carla Jimenez, and Scott MacArthur. The special premiere of new comedy THE MICK will air Sunday, Jan. 1 in all time zones immediately following NFL doubleheader game coverage and THE OT, at 8:00-8:30 PM ET and 5:00-5:30 PM PT, on FOX. The episode then will encore that same night in the Pacific time zone at 8:00 PM and the Mountain time zone at 7:00 PM. The series will make its time period premiere with an all-new episode Tuesday, Jan. 3 (8:31-9:01 PM ET/PT). It’s pretty much everything Mickey has never wanted. Regardless, she’s determined to rise to the occasion and transform these little monsters into honest, hard-working, decent members of society – something she knows absolutely nothing about. Being a mother was never in Mickey’s game plan, but these kids desperately need a parent. And as irresponsible as Mickey has been her entire life, she may discover that responsibility and motherhood aren’t the buzzkill she always thought they would be. The series also stars Carla Jimenez (“Raising Hope”) and Scott MacArthur (“Angie Tribeca”). THE MICK is produced by 20th Century Fox Television. The series was created/written by John Chernin (“It’s Always Sunny in Philadelphia”) and David Chernin (“It’s Always Sunny in Philadelphia”). The Chernin brothers, Nicholas Frenkel (“It’s Always Sunny in Philadelphia”) and Oly Obst (“Barely Famous”), along with Randall Einhorn (“Nurse Jackie,” “The Office”), who directed the pilot episode, are executive producers. Kaitlin Olson is a co-executive producer on the series. “Like” THE MICK on Facebook at facebook.com/TheMickFOX/. 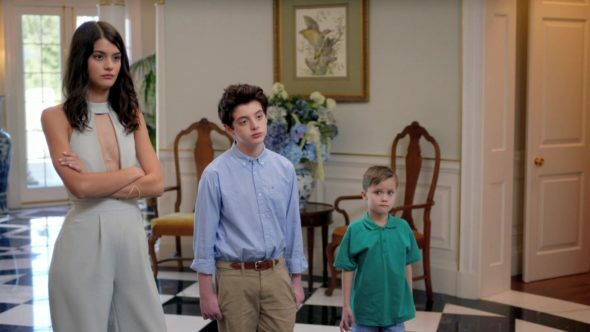 Follow the series on Twitter @TheMickFOX and join the discussion at #TheMick. See photos and videos on Instagram @TheMickFOX. What do you think? Do you plan to check out The Mick TV show on FOX?